Foreclosures and job losses can be devastating. Rather than get yourself down about the slings and arrows of outrageous fortune, use this tragedy of Shakespearean proportions as an opportunity to do something new. 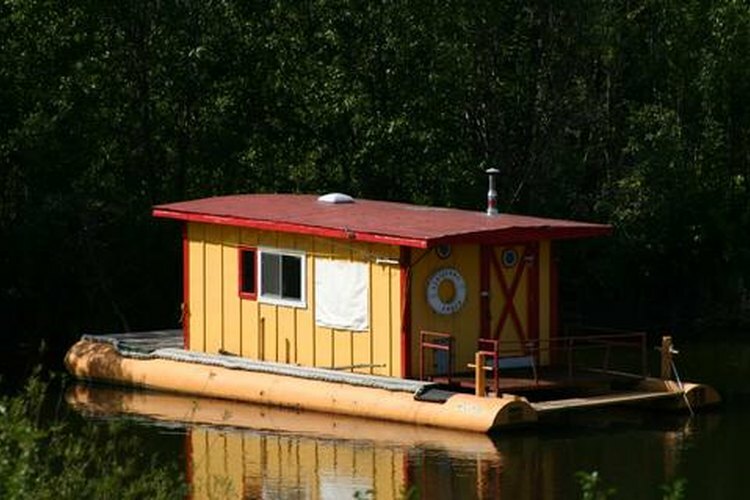 An adventure on the high seas may be the stuff of the novels of yesteryear, but you can simulate those adventures by building and living on a shallow draft house boat on an inland or coastal waterway. Use one 55 gallon barrel for every 500 pounds of load needing support, including the weight of all building materials and an estimated 10 passengers at 200 pounds each. The easiest way to get the weight of your building materials is to have them weighed at the building supply store or have your delivery vehicle weighed before loading and after loading at a nearby truck scale. Be sure to include everything that will be aboard when you weigh the materials. Lay your keel. In a regular boat, the keel would be curved and underwater, but in a houseboat your "keel" is the center board going from bow to stern, that is, from the front of the boat to the rear, where the engine will be sitting. To do this, lay your 2" by 6" boards on the narrow side, like floor joists. If you intend to have two rows of barrels, lay three joists, if you intend to have three rows of barrels, you will need five joists. The advantage of three sets of barrels is that the boat will be more stable when struck from the side by waves and wakes. Frame your deck as if your are making a patio deck, being sure to check that everything is level. To check level, place a spirit level on a board that is longer than your deck is wide. Using shims, adjust the decking boards until the bubble stays between the lines on the level. Use only marine grade bolts, nuts, screws and washers, to avoid corrosion and possible loss of integrity of your vessel later. Once your deck is framed, and laid, turn it over with the keel up. Lay your barrels in rows, making sure that they are in line with one another both vertically and horizontally. For additional stability, add bilge lines and a pump so that you can add or remove water from barrels as needed to correct any listing of the boat later. Screw or bolt barrels into place, being sure that each barrel has the same arc as all the others, to avoid your barrels forcing their way up through the decking when on the water. To ensure each barrel has the same arc, lay barrels in place and mark the place where the barrel meets the boards. Measure the arc and then use that measure to ensure all the others are the same. Build your quarters. Be sure that the structure is both level and plumb, and that the building is evenly distributed across and along the keel on both sides. If the structure is not balanced, the boat could capsize in light chop. Be sure to allow space for bunks, benches, stowage, and room for a head, the nautical term for toilet, if you choose to have one on board. See the resources at the end of this article for sample plans for your house boat living quarters. Marine use rated stainless steel screws, bolts, and nuts.